The second half of the Spring Term proved to be an extremely busy one for a large number of MGJ’s pupils, who left their classrooms briefly to participate in a varied menu of sporting events. A total of 7 Years 4, 5 and 6 children entered the Surrey Schools Primary Cross-Country event at Priory Park Reigate, on a very cold Saturday morning at the beginning of March. Running on a course of approximately 2 kilometres, which was the first time any of the children had run in such an event, or over such a distance, all of them excelled themselves with the top performance being Libby Bance (Year 5) who finished in a superb third place. Teams from MGJ took part in 3 Surrey hockey tournaments within an 8 day period just before the Easter holidays. On the Monday the snow came again, a team of 9 Year 5/4 boys took part in the Surrey U10 Boys In2Hockey Championships at Woking. Ignoring the cold and the periodic blizzards, the boys put up a very creditable performance and whilst they were unable to win any of their matches, all bar one of the losses was by a single goal. Three days later it was the Year 5/4 girls’ turn when fortunately the variable English weather produced a sunny and much warmer day. Whether it was this that inspired the girls or not, they had a more successful competition, finishing third in their pool, and then producing a dominant performance in their play-off match to win 4-1 and secure 5th place overall. Given that the children have only been playing In2Hockey, (England Hockey’s transitional version of the game for 10-14 year olds) since Christmas and that their opposition all came from schools with a tradition in playing Hockey as well as facilities to support this sport, all the children taking part excelled themselves and should be justifiably proud of their achievements. Thanks to Horley Hockey Club who subsidised the two practice sessions on the AstroTurf pitch at Hazelwick School Crawley which gave the children invaluable experience of playing on that surface and on a pitch of that size, prior to the competition. The third event saw a total of 17 Year 6 and Year 5 boys and girls participate in the Surrey SE Area Quicksticks tournament at Oxted. In absolute freezing conditions both MGJ teams played some excellent hockey resulting in them both winning their way through their respective pools to qualify for the semi-finals, with the B team finishing 3rd overall whilst the A team progressed through to the final where they came up against the local “favourites” who had swept all before them in earlier rounds. The final was a tense affair with MGJ showing some excellent defence against skilful opponents. MGJ actually managed to score first but when the final whistle blew the scores were tied at 1-all. There followed 4 consecutive periods of extra time but neither team was able to add to their tally. The result therefore went down to penalties but again after the 5 compulsory attempts the teams were still tied 3-3 and it wasn’t until the 7th attempt that MGJ eventually succumbed to their opposition. All of the children participating that evening cannot be praised highly enough for overcoming the sub-zero temperatures and performing to such a high standard. As a result of their success the A team now qualify for the All County Finals to be held at Woking in July. Groups of Year3 and Year 4 children went to Oakwood School on 2 days in March to take part in a Multi Skills session run by Sports Leaders from the Secondary School. This activity is always thoroughly enjoyed by all the children taking part with a lot of skills being learnt and/or improved and this year was no exception. On another bitterly cold afternoon our two netball squads played in the HLP Netball Tournament. Both squads finished in second place in their respective pools which means we have qualified for the East Surrey tournament to be held at Hillcrest School, Caterham in April. After an extremely enjoyable day of taster sessions run by UKDBA, a total of 8 children from Years 5 and 6 went to the ACS International School in Cobham for a Dodge ball competition. 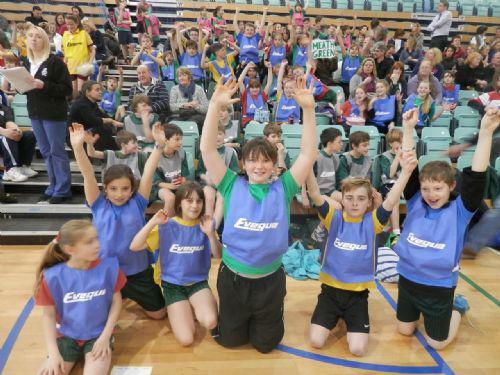 This was the first time that children from MGJ had competed in this sport and despite being placed in a highly competitive pool, which contained the teams who eventually filled the top three places overall, they achieved a highly creditable 9thplace. As always, all these events were supported by numerous parents to whom a big “thank you” is due as without their help and support it would not be possible to make such a wide range of opportunities available for the children. Also thanks to Mike Ledwich for compiling this report.